I have carried heavy things. A nine pound baby snuggled inside the womb does take its toll. Three babies cradled in a delicate secret place where God knit them together. Growing, making my back cry out in protest, my heart exploding into a million pieces marked with each of their names. And the relief when they entered the seen world, the lightness in my middle, the joy of seeing their tiny features in that harsh fluorescent lighting. I put down the heaviness of carrying my babies and picked up the heaviness of falling completely in love with them. Heavy things. Couches, many couches, through years of moving and changing and growing and building a faith that says, Yes, I will go. A faith that starts with fears and imperfections and doubts and insecurities–somehow God used those shaky foundations to accomplish His purposes. And so, we have moved. And, we have looked into each others’ eyes and said with no words Here goes nothing. We set heavy couches in perfect spots, and picked up the heaviness of living His will. I have carried heavy things. 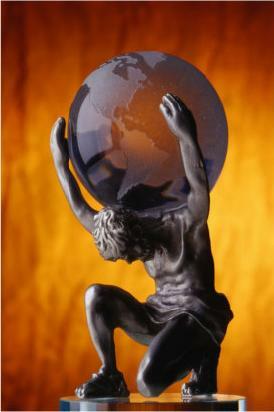 Sometimes I feel like poor old Atlas, barely standing, stooped, with a great world of trouble on my shoulders. Trouble is relative, or it’s subjective, or it’s a who-has-it-worse game of show and tell. I don’t have it worse. I have it better, much better, yet sometimes this world on my weak little shoulders feels more like a record, stuck on one or two phrases: You’re messing up. You’re blowing it. You’re not keeping it together. I feel the burden of my not-enoughness, like I can feel a nine pound baby in a stretched-to-its-limit womb. Like I feel a couch digging in to weary fingers on moving day. The weight of my inadequacy. You see, that’s what really weighs us down. That’s the heaviness I picked up on day one as a mother. That’s the heaviness we feel as God starts each new adventure in our lives. That’s the heaviness of being Christian people. The we-aren’t-good-enough. And, this post really isn’t about how we are good enough. It’s not about how we should love ourselves more or should believe in ourselves more or should stop listening to those records that play over and over in our weary heads. Jesus said we can come to Him with our heaviness. He said we can tell Him about it when we’re having our Atlas moments. He said He can give us rest. But, not because we are wonderful and we deserve rest. He said, Learn from me. I am humble and gentle in spirit. That heaviness that we feel? That not-enoughness? How does a flawed human being attain humility? By facing the reality that we are simply not enough. Not enough to carry heavy things. Not enough to be a load-bearer. Not enough to say I can do this thing. We are designed to be God-leaners. To be completely dependent. We were made to realize that it is true: we are not enough. Each and every time that I pick up a heavy thing, I am confronted with the reality that I am simply too weak to carry it. Too small to stand up under the weight of motherhood. Too shaky to carry the boulder called stepping-out-in-faith. And that is where we come to Jesus. He says His yoke is easy and His burden is light. Does this mean when we are Christians we will not be faced with heavy things? No. It means that when the heaviness hits, we have a flawlessly strong brother and friend who will carry the bulk of our load. Because He knows we aren’t strong enough. Little ones, run to Jesus with your heavy things. He knows you are not enough. You weren’t created to be a load-bearer. But, when you recognize your need for Christ, when you humbly admit that you need Him to hold you up while you crumble, then you are more than a load-bearer. You are an image bearer. And, you show the world what it’s like to trust in the One who promised that with His help burdens are light. Then one day you wake up, and you can breathe again.